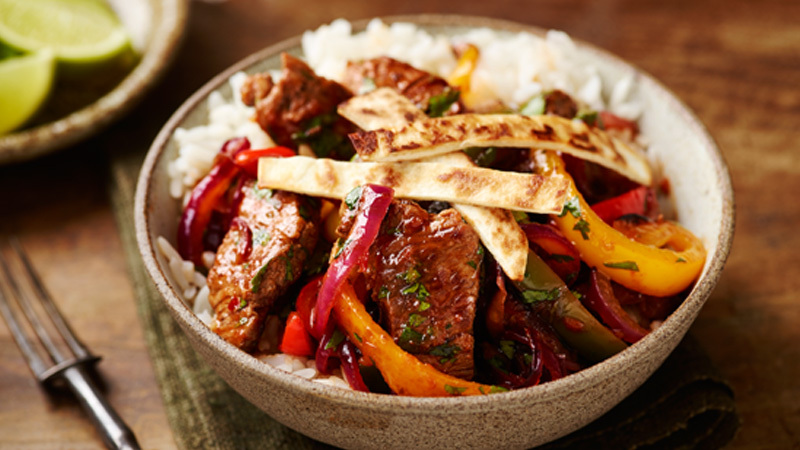 Forget the wraps and serve spicy beef fajitas in a bowl with rice and topped with crispy strips of fried tortilla! Cook the rice in a large saucepan of lightly salted water for 10-12 minutes until tender or as directed on the packaging. Meanwhile, heat half the oil in a large non-stick frying pan over a high heat. 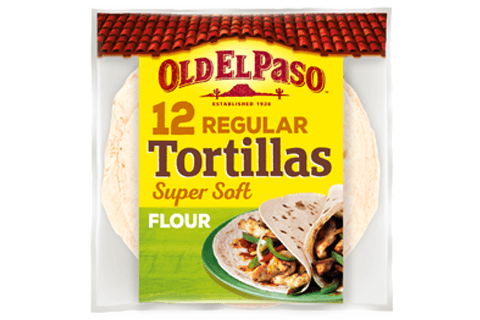 Add the tortilla strips and cook for 1-2 minutes, turning once until pale golden and crisp. Transfer to a plate lined with kitchen paper and set aside. Heat the rest of the oil in the frying pan over a high heat. Add the steak strips and stir-fry for 2-3 minutes until seared (you may need to do this in two batches). Remove and set aside on a plate lined with kitchen paper. Add the onion and peppers to the frying pan and stir-fry over a high heat for 3-4 minutes until tender and any excess liquid has evaporated. Return the steak strips to the pan along with the salsa, lime juice, chilli sauce and cumin. Stir-fry over a high heat for 1-2 minutes until piping hot. Stir in the chopped coriander. Drain the rice and divide between four shallow serving bowls. Top with the steak fajita mix and the tortilla strips. Serve garnished with coriander sprigs and with lime wedges to squeeze. If frozen peppers are unavailable just use 2 thinly sliced red or green peppers. To slice steak very thinly, place it in the freezer for about 20 minutes then use a sharp knife to cut across the grain of the steak.